Where students plot the future, and we’ll help them get there! Pursuing Possibility. Cultivating Clarity. Mapping Opportunity. 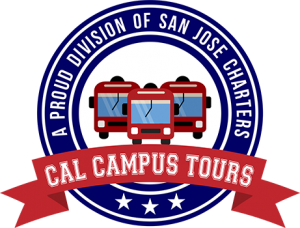 These are just a few of the ways that Cal Campus Tours is committed to supporting the continued education of your youth. As a full-service, SPAB certified transportation service, one of our most vital and growing initiatives is helping students envision where they see themselves after high school. If you are looking for a direct partner to create college tours that meet the needs of your academic population, we would be honored to serve you. SPAB certified team, meeting all CHP and DOT compliance requirements. Over a decade of experience providing a variety of affordable, educational offerings, including: campus tours, grad nights, field trips and sport team transportation. Established, reputable business relationships, trusted by Silicon Valley corporations, national technology and finance firms, healthcare organizations and community groups. Dedicated drivers & client support specialists to ensure stellar service & unmatched reliability. We understand that one tour does not fit all; therefore; we provide the possibility for completely customized college campus tours. Tours may be arranged by educational staff, teachers, parent organizations or initiated by interested families. College stops are determined by your students’ interests. Sample trips include: Bay Area & Beyond Campus Tours, NorCal College Experience, SoCal College Experience & the Sky’s The Limit (including out-of-state options). Affordable rates…because we know that college is expensive enough! Complete coordination of campus information sessions, overnight accommodations plus applicable air and ground transportation. Hosted charter ride includes refreshments (and supervision!). Time allotted for structured & self-regulated college campus exploration. Contact Angela Garcia for more information!